In preparing for this article series (read part I here) I asked Manuel [the editor-in-chief of Futbolgrad], do you want a real case. One with verified facts and one that highlights the real problems of money in Russian football? In his typically understated way, he said, “Let’s try.” So we’ve done just that. Not too long ago the hipster craze on social media was all about Rotor. This fine old club in Russia’s hero city Volgograd. A club that, we were reminded, knocked out Manchester United of the UEFA Cup in 1995. A club that reached the Final of the UEFA Intertoto Cup, that twice finished Runners-Up in the Russian Football Premier League, and who have had more cosmetic changes than a 25 year old Moscow girl. But in reality, the one constant in the Rotor Volgograd story has been the appalling mismanagement of the club for over 25 years. Soaped up with fast money, the club were able to compete, given the attachment to the city’s past and need to create a new Russian identity. Federal funds flowed in, as did criminal enterprise using the club as a way to capitalize on the chaotic ex-USSR economy of the 1990’s. Money came and money went, yet those running the club in its “Glory Days” were still there when the club went through the #SaveRotor shame on Twitter. From his high horse, Krasnodar’s Sergey Galitsky was happy to snipe on Twitter, though his agenda was more based on the removal of Krasnodar from the list of host cities in favour of cities without professional clubs—Sochi and Volgograd. Yet he knew more than he would ever tweet. 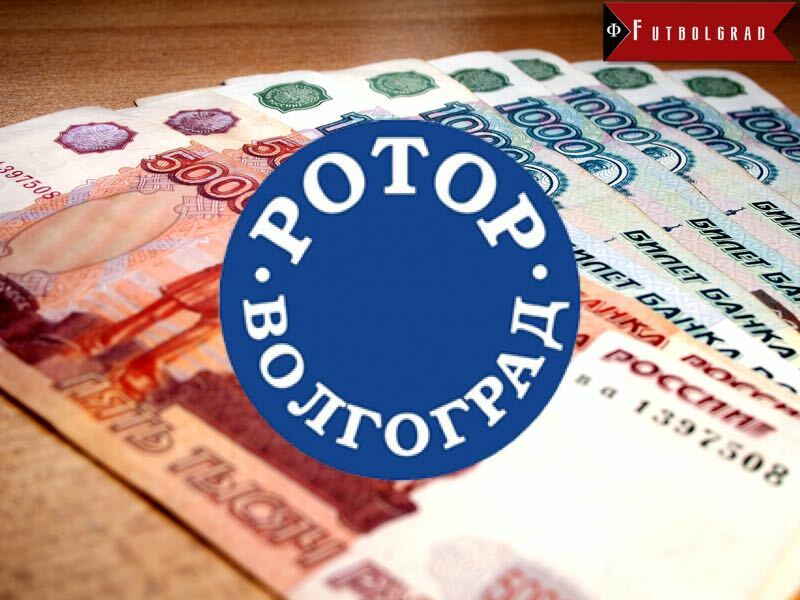 According to the All-Russian Professional Footballers Union, the debt owed by Rotor stood at 120-130 million roubles in 2015. From a former member of the City administration, the debt is double when taxes and small creditors are accounted for. Under condition of anonymity, she granted us an interview, providing us with facts, figures and names. AM: What was your relationship with the club(s) Rotor Volgograd? IN: I worked, first, in the administration of the City as an accountant, then I moved to the City Department of Education, then Sport, then into the Region Government for Sport. IN: 1992 until this year. AM: So more than 20 years working in Volgograd and with Rotor? IN: No, from 1993 I first had a relationship with Rotor, it was through the Department of Sport. I didn’t, then, have a relationship from 2003 until 2014. And then, as you see, my last contact was this March. AM: So what did you do with Rotor? What was your function? IN: Mainly checking accounts, how money was spent, providing reports, at first, for the City. It changed to be closer to the club administration but that was for a short time, maybe 1994, 1995, then I changed my position to the Regional Government in 2000. So I was not so close but still in contact. And 2003 to 2014 I only had financial reports passing on my desk, not direct contact. Though I knew, know, all in the club. AM: You spoke about “Russian Business”, can you describe some of this. IN: Oh, it’s many. Like money for players, salary, bonuses. Even when we had big crowds and money from the government, many players were not paid. The big boss, he decided who was paid. He decided how we would win. AM: Who to pay, officials, opposition, home team. AM: Did you take part in any of this? IN: I’m ashamed, yes. More than once, not so regular, but yes. AM: All teams? All officials? AM: Did anyone ever refuse? Any official, opponent? IN: (Shaking her head) No. For me, no. AM: You say, “big boss”, you mean Sergey Nechay? IN: No, not him. Shokh. AM: Rohus Shokh? (Rochus Schoch), a Kazakh-born football functionary who rose with Rotor, was with that other Southern basket case Rostov and with CSKA Moscow. IN: He knows how to do the job. He knows how to make sure the club wins. At this point in the interview my mind drifted back to a conversation I had with the head of the supporters club in Malta. When I asked why the new President had brought as Team Manager a known match fixer, the answer was: “We might lose one match, but we won’t lose two in a row.” It is the language of result organization—aka match-fixing. AM: When you say, “if we don’t do it, they will.” What do you mean? IN: I mean, I mean. (We spoke off the record for 10 minutes). AM: Can you explain what you’ve shown me, what you’ve told me in regard to the last question? IN: A player, very good one, came to me after we lost a very important game, said “XXXX, I’ve no salary for three months, none. Do you think I care? I have my wife and child to feed.” This was before, this was while we were Premier. AM: What did he do? IN: Our opponent from Moscow, in Moscow, gave money to him and three other players to play badly. IN: He told me $1,000, though I don’t believe it. I think it was more. The normal price was then $2,000 a player. AM: This still goes on, now? IN: Of course (looking at me with a shocked expression). AM: So this was all with bookmakers, betting? IN: Not at all, all in my experience was clubs needing results. It is still the same. Malta drifted back to me. That corrupt director who misappropriated funds at the season’s start told me at the outset of our project, “€100,000 will buy us the league. Last year Valletta paid €75,000”. For all the nice words about betting syndicates and other nonsense, the majority of match-fixing is for points and trophies. Though that doesn’t suit the global narrative, for neither media nor organisations. Just as WADA was not set up to stop doping, the whole anti-match-fixing hullabaloo is for clicks and ratings, not doing anything worthwhile. AM: Was it only players? IN: No, of course not, you see, this is important. The people in charge tell the coach, this game is not so important, we’re safe. The coach (she laughs) he says, what score this time? They tell him, close. We don’t want to be idiots. AM: So the coach took instructions to lose. IN: Or not to win. AM: And sometimes to win? I gave her a list of some unusual results from the mid-1990’s to early-2000’s involving Rotor and asked the background. She produced photos of her and colleagues with Manchester United players, with Russian football dignitaries, and with her former colleagues from Rotor. She didn’t want to discuss them on record. AM: Did you ever go to the authorities? To the Union, police? IN: What? Why? I mean, everybody did it. AM: On the topic of finances, how did Rotor get so good? What was it like in the 1990’s? IN: Very good, really. We had exotic players like Essau (Kanyenda), we had really good conditions, Doctors. Everything was good. AM: So where was the money from? IN: They don’t give money, really. (She shows me a small record of monies paid into a random company account, then some to the club and out to a company in London, UK). This company, they’re British, they work with the Russian company, but they have to be secret. They are dealing in a country they’re not supposed to (Iraq), supplying equipment. They pay the (random) Russian company for consulting, investing and services. The company invests in Rotor, Rotor pays a 3rd Russian company for “construction services”, they do the deal in Iraq. The money comes back from the (random) Russian company through the club to London. AM: How does this help Rotor? IN: A percentage of the money stayed with the club. Small, there were many, many like this. IN: From this company, from the London one, maybe seven. From others, more than three every year I worked there. Which I saw. AM: Was it the same with other clubs? IN: Probably for all. I only can speak completely surely about us, but there are other clubs in the Oblast who all had the same financial methods. AM: And match-fixing? It wasn’t just Rotor I think. IN: No, all. I can give an example. In 1996 we played Alania there, the officials were all bought. They gave everything to Alania, even a penalty, and it hurt us. We always, at this season, looked at the results of Lokomotiv (Moscow), Spartak used them very wisely. They one time were 2-2 and in the end Loko let them score a goal to win. One Lokomotiv player told me that he had a nice bonus that month. When we lost to Spartak earlier in this season, the officials (referees) told me, if you want to not lost, you pay us $10,000. IN: No, we didn’t have enough cash, only $4,000. If we had the money, we paid. AM: There is a match, in 1993, which you told me was bought to stop you from winning the league. Can you tell me why or how you think this? IN: Yes. (shows me newspaper cuttings, a photo of players and a football agent). With five matches left it was three clubs, Alania, us and Spartak. Alania lost, we won with Baltika and Spartak paid off Dinamo (Moscow) players to win. They did it at half-time. It was agreed to lose. The next week they were playing Torpedo. Torpedo was playing so well, winning 3-1. Then at half-time, same again. The players agent was given money from the club to go to the officials and Torpedo. Spartak won 4-3 and were even given a penalty. We were then playing Loko [Lokomotiv Moscow] and the officials gave everything against us and Loko played very well. We lost and Spartak were about to lose, then they got a draw against Rostov (then RostSelMash). AM: Explain please what you mean they got a draw. IN: Rostov scored by accident, so they let Spartak score. The match had been agreed as a draw. The last games we all fixed. Alania paid the other team (Lokomotiv Nizhny Novgorod) good money and they (Loko) scored an own goal. Spartak were the famous half-time team, they beat Zenit 2-1, with a strange goal in the second half. AM: Did you ever visit officials or opposition at half-time? IN: Maybe once, twice. That was only at times when the match we should win was too close. Many teams, even big ones like Torpedo, Zenit, Dinamo, they played a hard first half so that they’d get more money at half-time. AM: So the title came down to who paid the most to whom? IN: There were other things, like our doctor, our coach, good players. Not everyone can just win by paying. And later when we had less money, it was smaller amounts to pay players or referees. This summer brought me back to a Maltese Premier League match whose result was known in advance, except by me and one of our players. The youngster, one of our foreign contingent, ran himself into the ground chasing every ball. He was speedy, brave and skilful. Yet he was always off-side, early or late for passes, or simply not given space by team-mates. Of those in our Directors section and his team-mates knew the match was sold to title-chasing opponents for the price of a month’s wage bill, Yannick “Yala” Bolasie and I were out of the loop. Distraught afterwards in the dressing-room he broke down in tears, nobody consoled him. I tried to console him, telling him that the Plymouth Argyle scout was impressed and that he’d be away soon enough. It didn’t help. Our opponents were being handed the title for a bag of cash. Yannick moved at the end of the season and now as he plies his trade in the English Premier League with Everton, most of his former team-mates (who were all bar two part-timers) retired owed large sums of money from clubs who refuse to do the right thing. And so it was when we parted in Moscow that my interviewee gave me the most telling piece of information.